American interdisciplinary artist Peter D. Gerakaris was raised a free-range child in New Hampshire, earning a BFA from Cornell University in 2003 and an MFA from Hunter College in 2009 where he received the Tony Smith Prize. 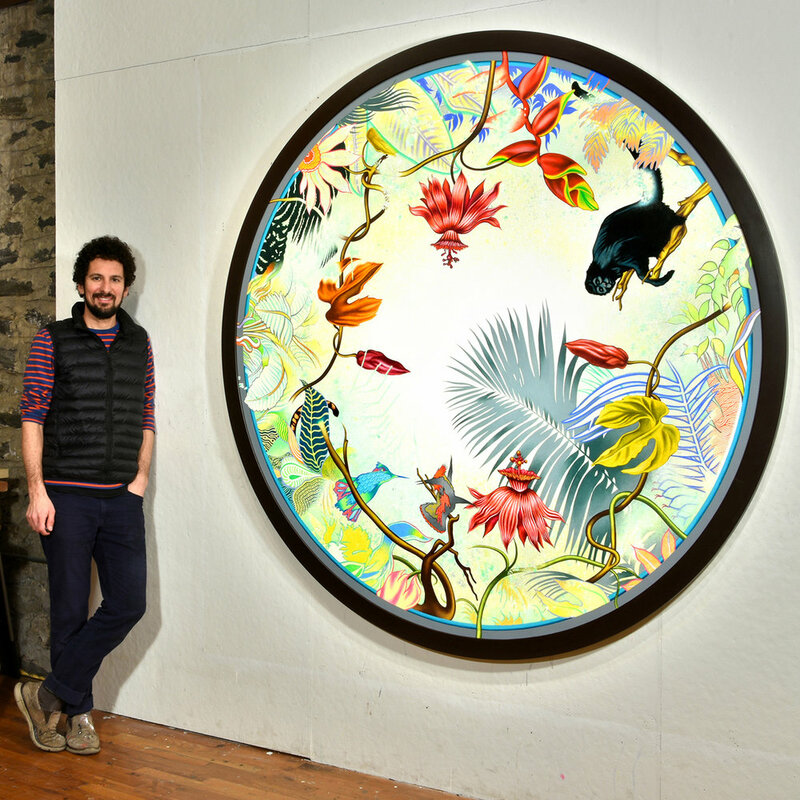 Gerakaris’ kaleidoscopic paintings, installations, and origami sculptures engage nature-culture themes and are showcased in various permanent institutional collections including the National Museum of Wildlife Art (Jackson, WY), the U.S. Department of State Art in Embassies Program in Libreville, Gabon (Africa), the Schomburg Center (New York, NY), the Waskowmium (Burlington, VT), the Warwick Hotel (Bahamas), and Citibank, in addition to a spectrum of private collections around the globe such as Beth Rudin DeWoody and the William Lim Living Collection (Hong Kong, China). Additionally, Gerakaris has created a variety of large-scale, site-specific commissions awarded by Cornell Tech, The Surrey Hotel, Bergdorf Goodman, and the Warwick Hotel Paradise Island Permanent Collection (Bahamas). He has also been awarded a large-scale public art commission to be permanently installed at PS101 (Brooklyn) in 2019 through the NYC Department of Cultural Affairs Percent for Art Program. Having received distinctions such as the National Academy of Art’s Edwin Austin Abbey Fellowship and the Vermont Studio Center’s Clowes Foundation Full-Fellowship, his artwork has been exhibited internationally at the Bronx Museum, Wave Hill, Daniel Weinberg Gallery, Google NYC, FX Collaborative, Chinese Contemporary (Beijing), various art fairs such as Scope and the Doors (Seoul), iSolAIR (Cape Verde Islands, West Africa), the National Academy of Fine Arts, and the Mykonos Biennale, while also being featured in publications like Architectural Digest, the Financial Times, and W Magazine. Peter D. Gerakaris’ energetic “Post-Pop Botanic” style tickles the retina and mind, presenting a postnatural vision of nature as if filtered through a pop-cultural lens. In this space where nature and culture converge, the artist passionately examines motifs like medicinal and poisonous flowers, pollinators, owls, endangered and invasive species, all rendered with vibrant coloration. The tension between these visual layers is meant to echo society’s increasing disconnect with our natural environment. With a signature palette of tropical colors and kaleidoscopic patterns, Gerakaris' meticulously layered details offer worlds within worlds for the viewer to explore. Favoring unconventional formats such as the tondo (round canvas), origami forms, and honeycombs, Gerakaris’ artwork serves as both macro and micro lens, transporting viewers through a metaphysical window. Gerakaris’ interdisciplinary approach includes many thematic strands that traverse painting, works on paper, wall murals, installation, and origami sculpture. His work also engenders a strong sense of place whether experienced as a large-scale public installation or a private commission. His public installations commissioned by the NYC Percent for Art Program, Bergdorf Goodman, Cornell Tech and The Surrey Hotel Rooftop Garden embrace the many challenges of responding directly to a site, while offering multilayered interpretations for diverse audiences. Many of Gerakaris’ projects also include optional ChromaDepth 3D Glasses, which offer an interactive and spatialized color experience. The glasses reveal new meanings as viewers experience bold chromatic and thermal shifts that reflect seasonal moods and climate change. Embedded with many art historic references and a profound love for the traditions of drawing and painting by hand, Gerakaris’ process inevitably blurs analog and digital. Whether synthesizing traditional gold leafing techniques and Byzantine brushwork with electric coloration in his “Icon Series”, or rendering the illusion of collage entirely by hand with paint in his “Masks” and “Tropicália” series, his work ultimately harmonizes its hyper-graphic quality with a human and cerebral touch. Deeply inspired by extensive travel and residencies in China, Central America, the Caribbean, and West Africa, many bodies of Gerakaris’ work, such as “Tropicália”, not only question our assumptions about paradise, but also participate in a global dialogue. Having absorbed a myriad of international influences, music, iconography, and perspectives, the artist’s hybrid approach parallels a global civilization that is growing almost as wildly and chaotically as nature itself. All Content ©2018. Peter D. Gerakaris. a.r.r.